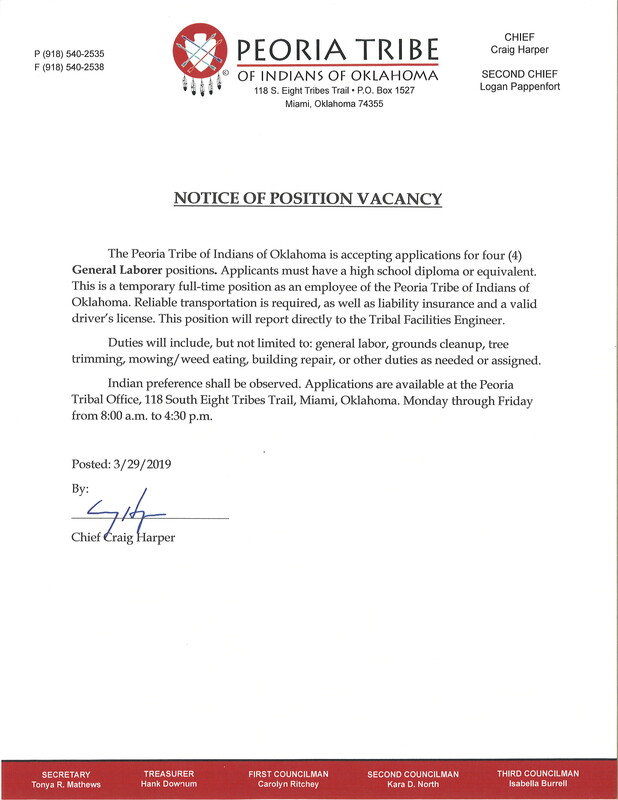 Now accepting applications for four (4) General Laborer positions. Click here for application of employment. Click Here for an application of employment. 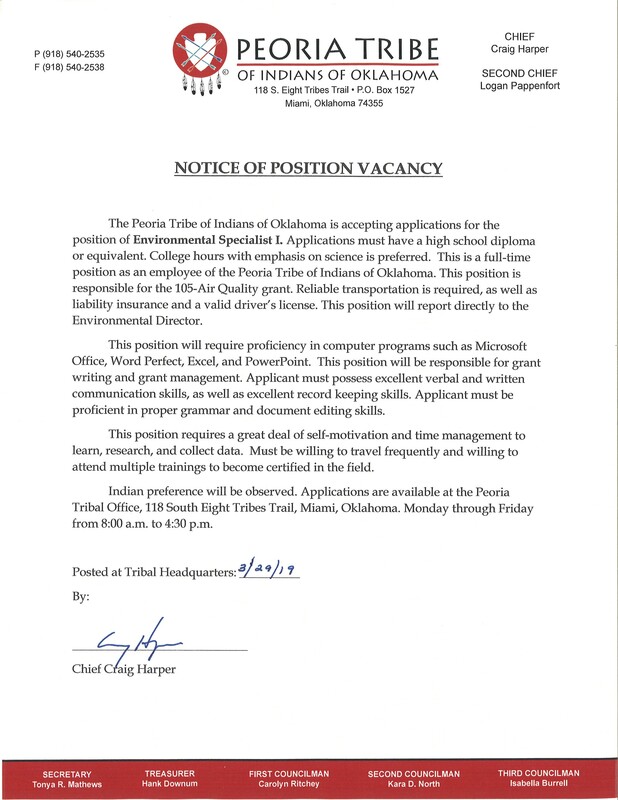 To apply you need to complete an application at the Peoria Tribal Office. Bring in a resume, a Tribal Membership Card (or copy), and a short essay stating why you would be a good candidate to work at the Peoria Tribe Aquatic Facility. Willing & able to perform hard labor outdoors in all weather conditions! For any questions please call the Tribal office. There are several new t-shirt designs for sale and a variety of silver and turquoise jewelry pieces (necklaces, earrings, rings, etc) available. A new online store will be coming soon! We can now take credit cards!! Contact Lacie for more information. March 2nd is quickly approaching and the office is bustling with activity as we are coordinating all aspects of putting the meeting together: Reports, room set up, trading post items and such. This is a busy time of the year and the staff is always eager to ensure that the details are all taken care of and that each Annual meeting will be the best that it can be! As a reminder, the Annual Meeting will take place at the Peoria Showplace, Buffalo Run Casino & Resort. We are excited about this and have been working with the Casino staff to ensure all the details are taken care of. Also, there will not be an election, you should have received notification of the cancellation. According to the Election Ordinance: “In the event that only one candidate files for elective office, that candidate shall be declared elected. In the event a candidate is declared elected, it will not be necessary for the Peoria Tribe to conduct an election by ballot for that elective office. Furthermore, in the event a candidate is declared elected, the candidate shall assume office immediately in the case of a vacancy, or at the next annual Peoria Council meeting upon the expiration of an elected official’s term.” With that being said the day will begin with lunch at 11:30 am – 12:45 pm and we will start the Council meeting at 1:00 pm. The day will be concluded with the Stomp dance with the evening meal being served at 5:30 pm and the Stomp dance will begin at 7:30 pm. We look forward to this Annual gathering of our membership. This is a time to conduct business, but it is also a time to gather, share with one another and celebrate being Peoria! We hope to see you and your family members on March 2nd!